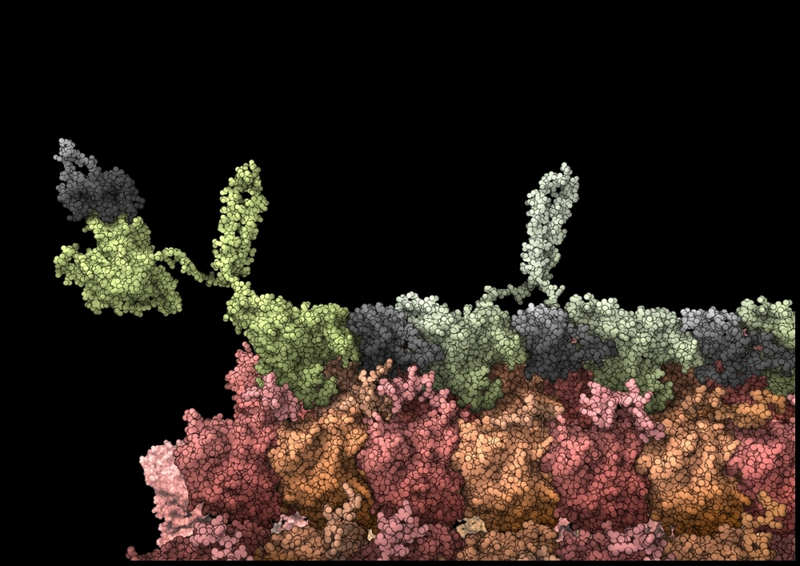 The protein dimer kip3 walks with its two 'legs' to the plus end of microtubles. When it reached the final tubulin dimer, it is kicked of off the microtuble together with the dimer under its 'feet' by the the next kip3 approaching the plus end. By this process, microtubules are shortened at their plus end under tight regulation. This picture illustrates the final step right before the kip3 is kicked off by the next kip3. All structures are built by molecular modeling and have atomic detail. The long C-terminus of kip3 is left out. The shader is a special shader for structures with atomic detail.